This is a term used by pest technicians to describe the presence of live termites discovered during their inspection. If they are ‘active’, this means they can be fed a bait to take back to the nest to kill off the colony. When the term ‘evidence of termite activity’ is used, this might only mean they have found some termite damaged timber (obviously caused by live termites but not necessarily currently ‘active’). The inside of termite galleries is protected from ageing and deteriorating agents such as light and the accumulation of dust. This makes it almost impossible to determine the period of time since live termites were present. These are essentially monitors that can accommodate or aggregate many termites. The more termites aggregated, the higher the likelihood of success in getting enough bait back to the nest to kill it. This is a nest up in a tree. The colony usually feeds inside the hollow of the tree as well as building tunnels down the outside of the trunk and across (or just under) the soil surface to their preferred food, usually leaf-litter and dead grass. Termite damage is rarely inflicted on houses from these colonies. This is more an outpost or a re-hydration structure which is often built close to ground level, and usually found inside the wall cavity of buildings. It is a mass of moist ‘mud’ where workers and soldiers can re-hydrate before a trek back to the nest. If there is no queen present, it is not a nest. A protected source of bait, which in this context, is made available for termites to harvest by leaving their feeding environment to enter directly into the dark and enclosed environment holding the bait. The cache can be in any container affixed to the outside of the attacked wood after a hole is made into the working galleries so termite workers can enter the cache without experiencing a differentiation in security and atmosphere. 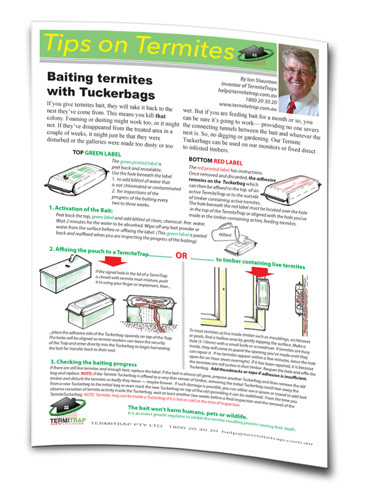 Our Termite Bait is enclosed in a foil “Tuckerbag” with an adhesive on one side so it will adhere to the top of a Trap OR to the outside of timbers infested with busy termites. The basic building block of wood (and cotton) and other plants after the starch, sugars, resins, water, etc, are gone. Termites have a protozoa in their gut without which they could not digest it. The protozoa is transferred by the workers along with regurgitated food to the nymph as soon as it hatches from the egg. This is an insect growth regulator (IGR) also known as a chitin inhibitor. A termite nymph goes through a series of moults as it increases in size between egg to adult. (See cuticle). The nymphs are fed by the workers regurgitating cellulose brought back from the feeding areas of the colony. The nymphs are affected by the minute dose of chlorfluazuron in the cellulose bait harvested from a cache you place where you’ve found them. The nymph then cannot produce enough chitin to form it’s new cuticle and it dies. Inside the warm and humid nest, the death event of thousands of nymphs causes decomposition and fungus growth the workers cannot clear and the whole nest dies including the royals which are in the centre of it all. Workers, soldiers and the royals also moult infrequently (maybe once a year). If they have recently consumed chlorfluazuron, they cannot complete the moult and they too, die. The nest is the central part of the colony where the queen and the nursery is located. In some termites, Mastos is an example, another queen may be produced and she sets up her colony at the edge or further reaches of the original colony and shares some workers and soldiers initially. It’s a flying-less start. And much more successful. Schedos also multi-nest on occasions. Another name is chitin. The outer shell of the insect is rigid, particularly the head and thorax. The muscles are attached to the inside of that shell and stretch across to other parts of the shell to provide anchorage points. When muscles contract to move a wing, a leg, a jaw, this outside shell is essentially an exo- (meaning: external) skeleton. The cuticle does not stretch to allow the insect to grow, so in the case of termite nymphs, they go through moults by splitting the old, small cuticle and emerge from inside it with a new, soft cuticle which they puff up with air/moisture until it hardens to the next, larger size. See chlorfluazuron and how it affects this moulting process. These termites do not require a reliable source of water other than what can be obtained from the atmosphere or the timber they are eating (usually close to 20%). They are more likely to be found in tropical areas where the temperature does not fluctuate greatly and the humidity is mostly above 60%. The West Indian Drywood termite, Cryptotermes brevis is occasionally found in Australia and AQIS (Quarantine) has to be notified. They supervise treatment to prevent this species becoming established. Some native drywood termite species are occasionally found in homes. In harvesting wood, termites are like miners in that they leave ‘walls’ of wood between the areas they are eating (like rooms in an art gallery). If you discover termite galleries and open them up to investigate the extent of the damage, you will destroy their security and if your investigation is so great they cannot quickly repair it, their instinct is to seal off the damaged area at an undamaged part of their working galleries closer to their nest. This will sacrifice maybe thousands of workers and soldiers to the opened, drier conditions (and probably ants) but the nest will again be defendable and survive. I don’t know a termite psychologist, however, a theory for why termites seem to always be on the search for alternative food sources is based on the evolutionary theme of survival. Colonies with an inclination to have many supply lines survived because over the eons of time there have been many floods, fires, large animals, etc., that have destroyed or moved even large logs. Without a food source back up —colony demise! So the termite species with an exploratory attitude will survive. As we said earlier, termites have always recognised there is more wood above than underground. In today’s world of structures, there is actually more dead (or seasoned) wood above ground in structures than in an unlogged forested area. Just look for the very few dead trees among all the healthy ones and think about the amount of timber inside structures in a new development of the same sized area. And, another thing to contemplate: every piece of timber in every house that has ever been attacked by wood-eating termites was first discovered by a termite scout leaving the active areas of an existing nest and walking above ground-level to find it. How? Mature workers, usually a few years old… and probably approaching their use-by dates, leave their galleries on a warmish, humid evening to go exploring for new food sources. More of them are unsuccessful than successful (just as well for human habitation) and during the long night when there are fewer ants, lizards and birds about they take their chances. They don’t have eyes but other senses are highly developed including being aware of carbon dioxide, the by-product gas from decaying wood. There are also signals to be recognised from timber staining washed down into the soil after rain when the building was being constructed… and things we don’t know about for sure. By going “up-stream” the worker may negotiate over or around various physical barriers (not insecticidal barriers — unless these have been covered with a layer of new, untainted soil deposited during or after heavy rainfall). Finding timber up in a building is one thing, getting back home with the information is another. We all know the story of the bee that finds the first blossoms on an apple tree down by the creek and how it goes back to the hive to perform a “dance” which is the signal for the rest of the workers to head in that direction and so bring home the pollen and nectar. Well termites are also social insects. They are of a different Order to bees but it stands to reason that although there is no report of “dancing” back at the nest, a discovery often enough results in an attack. Some postulate they leave pheromone trails there and back, others suggest they must have a GPS system. One thing we know for sure is that larger or more attractive timber is attacked or preferred ahead of smaller and less palatable timbers. Imagine (and this is just lighthearted conjecture so you’ll keep reading), the scout eventually and against all odds, ants and birds gets back to the active galleries. He/she walks the coal-black but safe, tunnels back to the nest proper where it fronts the Grand Evaluation Committee to report on the find. What timber? what size? How far? Is it in a direction where we don’t have an established food source? (Come to think about it, they may be smart enough not to waste personnel sent out in a direction where they already have multiple food sources — just saying). Imagine further, the information conveyed is assessed by the Grand Evaluation Committee and a decision is made to advise the Grand Construction Committee and they in turn get on with the job of constructing a new tunnel from a close part of the already established active area to the new food source. We do actually know that the tunnel is more often than not built in an almost direct line. Back to being serious — termites find timber and tunnel to it to begin harvesting it. Whether it be your floorboards, window frames or the much more easily discovered decoy timbers in the TermiTraps surrounding your home — foraging termites find timber. Don’t bet against it by thinking it is all too implausible. It happens. A chemical agent which interferes with or inhibits the processes of insect growth. Insect development goes through stages: egg, larva, pupa, adult (as in a butterfly: egg, caterpillar, chrysalis, butterfly) or a variation: egg, nymphs, adult (as in cockroaches and termites) getting larger in stages punctuated by a moult on the passage to adulthood). The IGR used to kill termite colonies, inhibits the production of chitin so the moulting process cannot occur. See chlorfluazuron and cuticle. ‘Integration’ means to include or add, so ITM means you will combine as many forms or methods of termite management as you can to get a better result than using one method alone. To manage termites, you design buildings so termites cannot enter without exposing their ‘mud’ trails, you use physical and chemical barriers, you add monitors outside to intercept them where you can easily bait them and you regularly inspect everything. The words in italics are components of termite control that can be integrated. Because few people will tolerate the presence of a termite mound in their yard or close to buildings, they tend to destroy it by letting in ants and other wildlife — or poisoning it with liquid insecticide. Although some mound-building termites will eat the seasoned timber in buildings, the ease of destroying the colony means they are not a significant contributor to the damage bill in Australia. Most (but not all) mound builders are grass and leaf-litter feeders. Termite tunnels have a high soil content and the adhesive is from their salivary glands… and maybe a bit of regurgitated food. Tunnels keep out predators such as ants and keep in humidity. If tunnels become too hot such as the direct midday sun, they will be empty until it is cooler. Specific scent-like secretion that conveys messages to those of the same species (or close relations). Mature trees, especially eucalypts and many fruit trees, decay from the inside as the old heartwood is no longer a living tissue. This hollow running up the length of the tree trunk is called a pipe. Being moist from the decay, termites find this very attractive food and it is in a sheltered/protected situation. A colonising couple finding their way into a pipe, probably through the hollow stub of a broken-off branch or a split in a fire damage scar will have the best chance of setting up a successful colony —which is why mature trees close to buildings should be drilled and the pipe investigated for active termites. Termites are insects in the Animal kingdom, which is divided into Phyla, a section of which is Arthropoda, a section of which is Insecta which is then split into Orders, one of which is Isoptera (termites) then we get to the Genus and then the species and then the variants (sub-species). The plural of genus is genera. When in print, the latin names of the Genus and species are set in italics with a capital for the first letter of the Genus name and no capital on the species name. When the species is referred to again, it is shown with the capital letter only of the Genus, dot, then the species name. examples: Coptotermes acinaciformis repeated as C.acinaciformis. They begin their colony in wood in the ground from which they derive three of their necessities: security, food and a constant source of moisture to humidify their nest. Whenever they leave the soil to find other food sources, they construct ‘mud’ tunnels and use the same ‘mud’ to block openings such as cracks and splits into where they are eating. Subterranean termites may build mounds, begin their colony in the base of a tree, or having begun in a small piece of wood in soil, construct their nest entirely below soil level from which they radiate in many directions to additional food sources. Most pest termites swarm in early summer when the temperature and humidity inside the colony is more closely matched by the outside warm and humid conditions. Depending on where you live, these colonising flights take place from October to early December. The big event is usually early evening after rain when the warmth and humidity is high and there is little or no wind. If you see flying termites and you are sure you won’t be the victim of lightning, get a powerful torch and wander around to see if you can find where they are emerging from. Their nest will be close by. Most termite colonies begin with just the royals finding their three necessities: food, moisture and security. The initial food source may be quite small and before it is totally consumed, scouts are sent out, above ground to find a new food source. Amazing stories of distances and difficulties conquered are told when pest professionals get together. Scouts leave pheromone markers on the way back to the nearest part of the current workings and, maybe after a committee evaluation meeting, a construction team is allocated the responsibility of making a secure tunnel to the new food —usually in reasonably direct line. See ‘mud’ and ‘subterranean termites’. This is a term used by pest technicians to describe the presence of live termites discovered during their inspection. If they are ‘active’, this means they can be fed a bait to take back to the nest to kill off the colony. When the term ‘evidence of termite activity’is used, this might only mean they have found some termite damaged timber (obviously caused by live termites but not necessarily currently ‘active’). The inside of termite galleries is protected from ageing and deteriorating agents such as light and the accumulation of dust. This makes it almost impossible to determine the period of time since live termites were present. This is more an outpost or a re-hydration structure which is often built close to ground level, and usually found inside the wall cavity of buildings. It is a mass of moist ‘mud’where workers and soldiers can re-hydrate before a trek back to the nest. If there is no queen present, it is not a nest. A protected source of bait, which in this context, is made available for termites to harvest by leaving their feeding environment to enter directly into the dark and enclosed environment holding the bait. The cache can be in any container affixed to the outside of the attacked wood after a hole is made into the working galleries so termite workers can enter the cache without experiencing a differentiation in security and atmosphere. 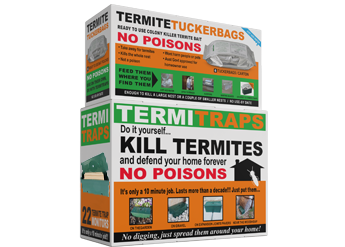 The Colony Killer Termite Bait is enclosed in a foil ‘Tuckerbag’with an adhesive on one side so it will adhere to the top of a Trap OR to the outside of timbers infested with busy termites. This is an insect growth regulator (IGR) also known as a chitin inhibitor. A termite nymph goes through a series of moults as it increases in size between egg to adult. (See cuticle). The nymphs are fed by the workers regurgitating cellulose brought back from the feeding areas of the colony. The nymphs are affected by the minute dose of chlorfluazuron in the cellulose bait harvested from a cache you place where you’ve found them. The nymph then cannot produce enough chitin to form it’s new cuticle and it dies. Inside the warm and humid nest, the death event of thousands of nymphs causes decomposition and fungus growth the workers cannot clear and the whole nest dies including the royals which are in the centre of it all. Workers, soldiers and the royals also moult infrequently (maybe once a year). If they have recently consumed chlorfluazuron, they cannot complete the moult and they too, die. Also, the eggs laid by a queen consuming the bait will not hatch. In harvesting wood, termites are like miners in that they leave ‘walls’of wood between the areas they are eating (like rooms in an art gallery). If you discover termite galleries and open them up to investigate the extent of the damage, you will destroy their security and if your investigation is so great they cannot quickly repair it, their instinct is to seal off the damaged area at an undamaged part of their working galleries closer to their nest. This will sacrifice maybe thousands of workers and soldiers to the opened, drier conditions (and probably ants) but the nest will again be defendable and survive. I don’t know a termite psychologist, however, a theory for why termites seem to always be on the search for alternative food sources is based on the evolutionary theme of survival. Colonies with an inclination to have many supply lines survived because over the eons of time there have been many floods, fires, large animals, etc., that have destroyed or moved even large logs. Without a food source back up —colony demise! So the termite species with an exploratory attitude will survive. The by-product gases from decaying wood includes carbon dioxide and a foraging scout will be sniffing for it. (See termite scouts). When detected, it will go ‘upstream’to find the source —a log, a branch, a house, a shed, and yes a termite monitor placed specifically to entice them into aggregation so they can be fed or dusted or foamed with a transferable agent to kill the colony. Having found such a source of cellulose, the scout returns along a pheromone trail, adding more pheromones so the workers can construct a protective tunnel through (sometimes above) the soil from where they are to where they want to be. The process can take days to months. Scouts find timber by walking above the ground more often than tunnelling through the ground. ‘Integration’ means to include or add, so ITM means you will combine as many forms or methods of termite management as you can to get a better result than using one method alone. 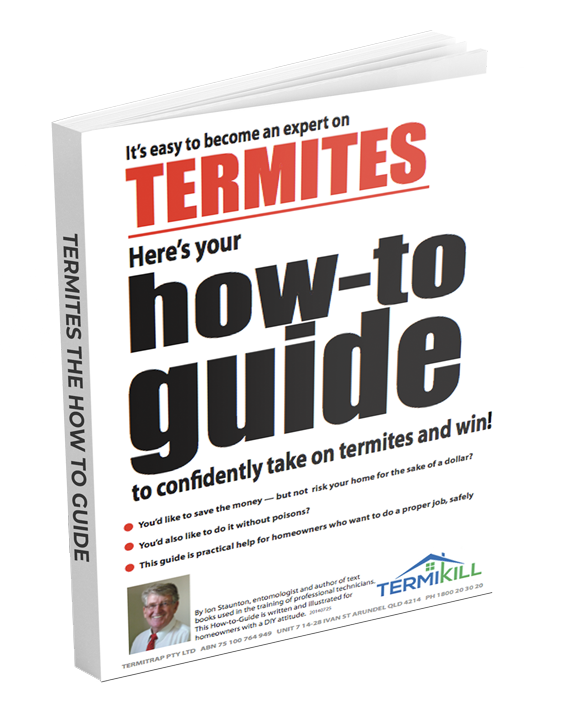 To manage termites, you designbuildings so termites cannot enter without exposing their ‘mud’trails, you use physical and chemical barriers, you add monitorsoutside to intercept them where you can easily baitthem and you regularly inspect everything. The words in italics are components of termite control that can be integrated. Because few people will tolerate the presence of a termite mound in their yard or close to buildings, they tend to destroy it by letting in ants and other wildlife —or poisoning it with liquid insecticide. Although some mound-building termites will eat the seasoned timber in buildings, the ease of destroying the colony means they are not a significant contributor to the damage bill in Australia. Most (but not all) mound builders are grass and leaf-litter feeders. Termites regurgitate food to build their tunnels and seal up cracks/crevices to keep in humidity and keep out light and ants. It looks like mud. There is often soil mixed in it. Specific scent-like secretion that conveys messages to those of the same species (or close relations). When a scout finds a new food source, for example, the pheromones deposited on the way out help it find its way back home and guides the tunnel builders back to the new food source. They begin their colony in wood in the ground from which they derive three of their necessities: security, food and a constant source of moisture to humidify their nest. Whenever they leave the soil to find other food sources, they construct ‘mud’tunnels and use the same ‘mud’to block openings such as cracks and splits into where they are eating. Subterranean termites may build mounds, begin their colony in the base of a tree, or having begun in a small piece of wood in soil, construct their nest entirely below soil level from which they radiate in many directions to additional food sources.